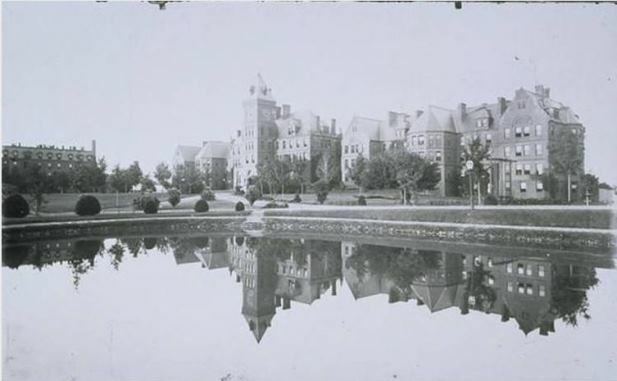 When the General Hospital for Insane of the State of Connecticut opened in 1868, its architecture and grounds reflected the influence of ideas transforming psychiatric care in the United States. The facility, located in Middletown, Connecticut, emerged at a time when social reformers lobbied at the state and federal levels for public institutions to be created that specialized in humane treatment for the mentally ill. Specifically, they believed that a rightly designed and controlled environment could have a positive influence on mental health. Inspired by the work of European physicians, such as Philippe Pinel, Americans in the early 1800s began reevaluating society’s handling of mentally disturbed individuals in light of a theory called moral treatment. This theory advanced the idea that, with proper medical attention, mental illness was curable. Prior to this ideological shift, mental disorders had not only been deemed incurable but were widely regarded as a symptom of criminal behavior or even a form of demonic possession. Thus, the handling of affected individuals focused on physical restraint and punishment rather than medical treatment. For example, the mentally ill were often kept in jailhouses, thereby reinforcing the association between mental illness and criminal behavior. Even after the discontinuation of this practice, options remained limited, particularly for the poor, and usually involved confinement under punitive, overcrowded, and unsanitary conditions. In contrast, moral treatment emphasized more humane approaches in settings specifically designed to promote the restoration of health and reason. The first significant private effort to introduce the practice of moral treatment in Connecticut came in 1822 when that state chartered the Hartford Retreat for the Insane. Over time, the Retreat’s patient population grew. Likewise, demand for care among those who could not afford treatment without state support also increased. In 1865, Connecticut’s Joint Select Committee met to discuss the resources needed to develop a public institution. Earlier attempts to create a state mental health asylum had not been successful. This time, Dorothea Dix, a nationally known mental health advocate instrumental in the state hospital movement, supported the effort. In 1866, she convinced the General Assembly to pass the Act to Create a Hospital for the Insane in the State of Connecticut. The state government chose to build the new institution in Middletown. In addition to the city’s central location, its proximity to the Connecticut River allowed for easy delivery of supplies—including heavy materials, such as stone—required to construct the hospital. Much of the planning for the new facility focused on creating an environment conducive to treatment. Those involved in designing its physical layout likely drew inspiration from the work of Philadelphia’s Dr. Thomas Story Kirkbride. A hospital director and founder of the Association of Medical Superintendents of American Institutions for the Insane, Kirkbride argued that a mental health institution’s architecture and environmental setting played vital roles in fostering patients’ well-being. His ideas, known as the Kirkbride Plan, called for one main building with adjoining wings to be set on pastoral grounds at a distance from a town’s main hub in order to provide privacy, safety, and control over the environmental stimuli to which patients would be exposed. Middletown granted the state 150 acres of farmland and $35,000 toward the hospital’s establishment. The site, which sat atop a hill removed from the downtown area, provided both the privacy and bucolic atmosphere consistent with the moral treatment philosophy. The main hospital building, designed by Philadelphia architects Addison Hutton and Samuel Sloan, also reflected the belief that the proper environment promoted the restoration of mental health. Built in the Second Empire style, the physical grandeur of the hospital’s external form sought to counter the cultural association between mental illness and filth (both literal and moral). Inside, certain spaces imitated those of a culturally refined home, complete with such accessories as photographs, artwork, and books. Such design choices reflected an effort to reduce the stigma surrounding mental illness as well as a belief that an emphasis on normalcy benefited patients. 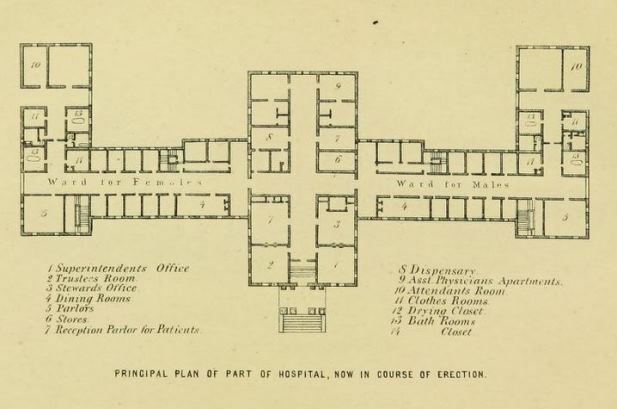 Providing structure also played an important role in treatment, as reflected in the hospital floor plan. Patients able to comply with hospital regimens occupied the wards closest to the central building, while the hospital reserved the rooms at the ends of the wings—farthest from the center—for those prone to violence. Patients who showed improved behavior might be rewarded with visits, or even a transfer, to the wards of those who exhibited greater mental stability. This spatial organization, which recognized varying degrees and types of mental disturbance, stood in contrast to earlier approaches which did not always make such distinctions. The Connecticut General Hospital for the Insane, as it was renamed, followed precedents set by the Hartford Retreat. It offered activities and amenities thought to instill a sense of civility and responsibility within patients. To promote healthy mental and physical stimulation, facilities included, a carpenter shop, baker shop, lecture hall, chapel, billiard rooms, and bowling alley. Patients might also labor on the hospital farm, where they helped with planting and harvesting. Medical theories of the time encouraged such interactions with nature as being therapeutic for patients. Also, learning to perform useful tasks might aid them in finding a place in society once released from the hospital. In practice, the therapeutic results achieved at the Connecticut General Hospital during its early decades did not measure up to the ideals that guided the design of its building and grounds. Overcrowding soon became a problem and, as a medical theory, moral treatment proved to be inadequate in its understanding of the nature of psychiatric illnesses. Still the creation of this state-run facility represented an important effort by 19th-century reformers. Not only did they promote more humane care for a vulnerable population, they also sought to understand the connections between man-made environments and human well-being. Although it has changed considerably since 1868, the Connecticut Valley Hospital, as it is now called, remains a state facility that specializes in the treatment of mental illness and, in more recent decades, of addiction as well. The original building, which serves as an administrative hub, still stands and is called Shew Hall after the hospital’s first superintendent, Dr. Marvin Shew. In 1985, the hospital received a listing on the National Register of Historic Places. Paola Maseda wrote this piece while a student at Wesleyan University during the 2013-2014 academic year. “Connecticut Valley Hospital.” State of Connecticut, Department of Mental Health & Addiction Services, 2014. Link. “Connecticut Valley Hospital.” Connecticut State Library, 2014. Link. “Finding Aid to the Connecticut Valley Hospital Inventory of Records.” Connecticut State Library, 2015. Link. “PDF - National Register of Historic Places Inventory Form - Connecticut General Hospital for the Insane (Connecticut Valley Hospital).” National Park Service, August 29, 1985. Link. Beers, Clifford Whittingham. A Mind That Found Itself: An Autobiography. New York, NY: Longmans, Green and Company, 1908. Link. Payne, Christopher, and Oliver W Sacks. Asylum: Inside the Closed World of State Mental Hospitals. Cambridge, MA: MIT Press, 2009. Connecticut. State Hospital for the Insane. Report of the Board of Trustees of the General State Hospital for the Insane, of the State of Connecticut. New Haven, CT: Printed by Thomas J. Stafford, 1867. Link. Earle, Pliny. 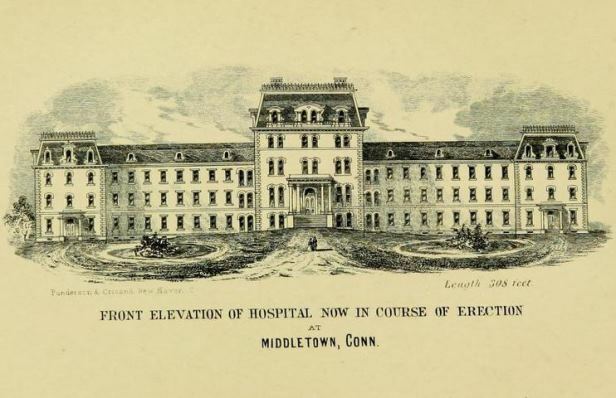 The Psychopathic Hospital of the Future: An Address Delivered at the Laying of the Corner Stone of the General Hospital for the Insane of the State of Connecticut, June 20, 1867. Utica, NY: Roberts, 1867. Link.